We here at the Rufus’ Food and Spirits Guide, and all of our dogs and roosters, hope everyone has a fun food-filled Christmas and that Santa brings them everything they want. This entry was posted in Food and tagged Christmas, Holiday. Bookmark the permalink. It’s quite a bit lower maintenance than your lot of roosters. Have a great one Cecilia. Thanks, Kay. Hope you have a great one too. 🙂 hehehehe… I’m shrivelling in the heat here, and you’re enjoying such a snowy winter… Last time I played in the snow was when I was a toddler, and it was only for a few seconds… dad got a snowball in his eye the second we got on the snow and we all had to go back home and rescue him!! Bother. Merry Christmas to you all, it looks a little chilly. Ha, the high will be around 50 or so today, not sure what that is in celcius off the top of my head. The dog photo is a few years old. We don’t get too many pictures of them in snow. Same to you and you’re welcome. And to you all ! Merry Christmas to you you all! Thanks, hope you have a great one. Merry Christmas to both of you! Thanks, enjoy your holidays too. Love the pictures! Merry Christmas to all! Thanks, hope you’re enjoying your Christmas too. Happy holidays to the entire Rufus gang. 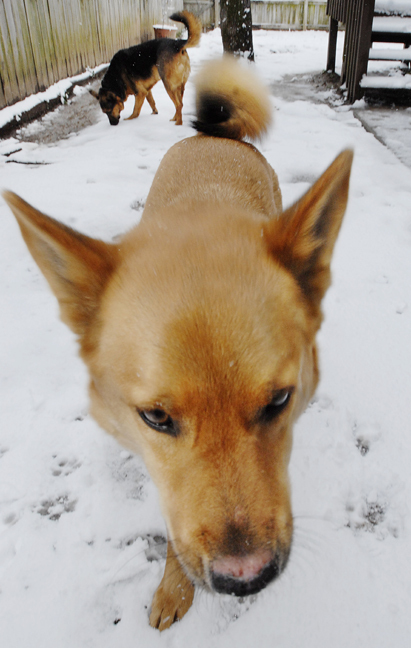 Those dogs look great…and is that Arkansas snow?? Tennessee sure doesn’t look like that right now! Happy Happy Christmas! Yes, but it’s a few years old. We have had snow already this year though! Merry Christmas, Katherine and Greg! Happy holidays to both of you! Thanks Sissi. Merry Christmas to you too. Merry Christmas to you and your household too! Thanks, Holly. And an early happy New Year too! 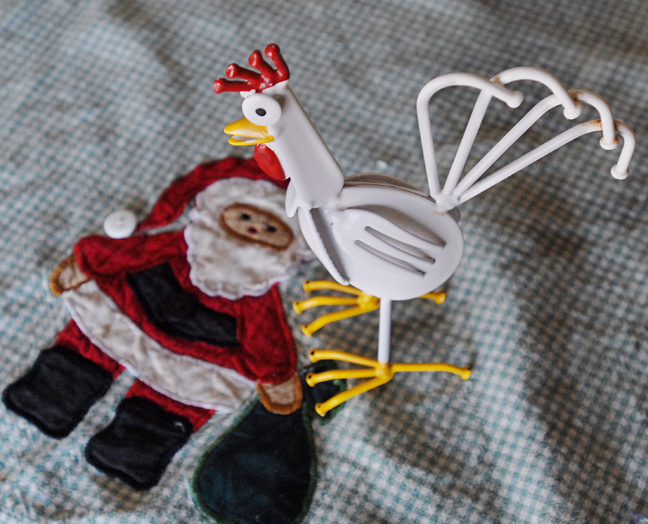 Very merry christmas to all of you inclusing your rooster. Hope everyone gets a nice gift this year. Happy holidays to you and Katherine and your furry and feathered critters! Hope you and Katharine had a grand day filled with Good Eats! Thanks, Judy. Hope you had a great Christmas and wishing you a happy new year. Looking forward to another year of Rufus! Thanks, Sally! Hope you have a great new year too. Merry Christmas to you both! Hope you had a wonderful holiday and that Santa stopped by for those cookies! My warmest wishes to you!! No, no, the German shepherd mix in the back is the one that likes Charles’ head. As for the red dog, he’s a true Heinz 57. He barks like a hound, is the color of a corgi, when he had an allergic reaction he looked like a shar-pei, when he was a puppy, he looked like a lab…And he does have the tail of either a shepherd or a husky. Aren’t mutts great? Merry Christmas!! We had a wonderful day, hope you did as well. A little late – Merry Christmas to all of you. Thanks, Mandy. Hope you had a great one too. Belated Christmas Greetings to you all from the pups, the hens, the cockerels, Big Man and Me!! Thanks, hope yours was fabulous too. Beautiful pups and very handsome rooster! Looks like a lively crew. : ) I hope all of you had a fantastic holiday! We did. Hope yours was great too. I hope you had a lovely Christmas! I’m a little behind in reading posts – when the kids are here they are my priority! We’ll gladly take a back seat to the kids. Sounds like you had a great time. We had a wonderful Christmas. I hope yours was, too. I love that rooster. I could take that off your hands. Thanks, Judy. Katherine’s dad bought that for her mom and she didn’t like it that much so Katherine got it. Thanks, we hope you had a great one too. And Happy New Year!